Today we explore an exciting venture in web based content management software - Millstream. It was founded in 2006 by Adrian Lynch from Perth, Australia. I studied Graphic Design, graduating in 1990, and have run my own businesses since then. I have always been extremely interested in the technical side of 'design' especially developing automated systems to remove the incredible amount of wasted effort that goes into publishing. I still do a bit of design work, but I now spend most time coding or on system design. • What is the name of your venture/company? 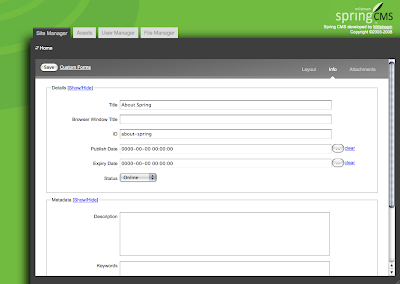 Millstream Web Software, our product is Spring CMS. Since 2006 we have focused on turning Millstream from a 'web design company' into a product based 'SaaS' provider offering Spring CMS, a simple to use, standards based content management system. I started a graphic design partnership called 'The House' in 1990 focusing on corporate identity and magazine publishing. In 1996 we had started to offer web design services to our existing clients, and within the next year I had started experimenting with database driven sites and rudimentary development of our first content management system. In 1997 I moved into a new partnership with Haymarket, a printing and publishing company to focus on managing their existing print clients, and introducing full web development services. This new partnership called Millstream, developed several custom built CMS's over the years which we could deploy for all our clients, but we also offered general development services, static sites and design. In March 2006, my wife Rosemary Lynch and I bought out Millstream, and 'Spring CMS' the content management system that we had been developing for the last year. The focus for Millstream from then on has been to offer a single subscription based solution to our clients. The business now consists of myself, Rosemary and our developer Christian Inkster. When we took over Millstream in 2006, we started with the existing Spring CMS and a long list of clients. Over the next 6 months we completely refocused the business, no longer offering 'general web services' or custom development. We shed quite a few of the initial clients that did not suit the new business and concentrated on building our subscription base. We are entirely focused on development and adding new features to Spring CMS allowing us to expand the number of monthly subscriptions to increase revenue. Spring CMS was initially designed to allow us, as designers, to deploy sites for our clients that provided an extremely simple management interface for clients to use, while at the same time being adaptable to any site design. This allows us to use the identical centrally installed system for small business clients through to large national clients. • What type of customers/people you are targeting? Primarily small to medium businesses - though we do have several national and international clients. We also have a large number of private schools using our system. We have established strategic alliances with several design and marketing firms in Australia - and the majority of work is now through them. We do also have a significant number of clients that have been through word of mouth. We have also released several scripts developed and used in Spring as Open Source which generate a lot of traffic and interest. We measure success purely by the number of monthly subscriptions. • What's your thought on being an aspiring entrepreneur? The benefits far outweigh the risks, that is for sure. Personally the ability to completely focus the direction of the business, and to maintain and develop that focus over several years is something I have never felt I could achieve unless I ran my own business. I think the 'innovators' are out there doing it already - with or without government support. I am not convinced the government need to do anything or if it's even the government's problem. Only one thing, I'd make sure that the National Broadband Network was nothing less than FTTH (Fibre to the Home) - we are rapidly falling behind, and anything less than full FTTH will be a pitiful waste of effort by the time it rolls out. I catch up regularly (though not enough) with the web community in Perth and Australia through AWIA and Port80. Twitter of course keeps me up-to-date with the minute-by-minute tweets of most of the Perth crowd. Luckily the Perth web community is extremely vocal and extremely well connected - it's a great place to be a developer. Only what has worked for me, focus on what you know, and what solves your problems - because it more than likely solves problems for a lot of other people as well. Thanks Adrian for sharing your thoughts with us. All the best for future.